SUP fishing – Manufacturers are jumping on board to bring you the best. Love to fish? Love to paddle board? You don't have to choose! There are boards especially designed for fishing that feature lots of volume for stability and are much wider than the typical SUP: up to 40" wide, 13’ long and 5" thick. Some of these boards can pack up to 400 lbs. Some are inflatable and others are hard boards. Serious fishing boards sport receivers, and plugs to attach coolers, tackle boxes, dry bags, packs, nets or anything else that is needed—very slick. Some manufacturers provide custom builds. Choose how many rod holders you would like, or style of storage box that becomes a dual-purpose seat, unique strapping systems, fish finders and the like. Manufactures have thought of everything the fisher might want or need! One company, (Dragon Fly) devised a way to quickly click your paddle into a holder on your waist once you've hooked a fish. Another maker (Hooked SUP) has built a board so stable that they also market it to be used for tandem riding. It is tagged the world's most stable SUP. 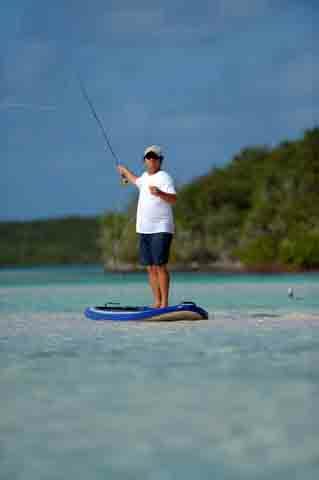 The manufacturers below include a list of specifications to begin to find the right board for your SUP fishing needs. Is your reel finger twitching? See videos at the bottom. And be sure to check out the links to fishing derbies at the bottom of the page. If you would like to post a fishing derby here write to info@standuppaddleboardingguide.com. • military grads PVC construction. Pau Hana Big EZ 12" by 36" by 5"
• up to 470 lbs. • also attach and "Wavejet" electric motor for cruising and trolling. h2o fishing SUP - 12' by 35" by 7"
NRS Reel Fishing Inflatable 11'4 by 34" by 4". 40 lbs. Badfisher inflatable fishing SUP - 11' by 40"
Stride Waterman Stand Up Paddleboard / Raft- Inflatable - 12' by 40"
Get a box of hand-picked baits delivered to your door each month tuned to your specific fishing needs...a unique concept. This is a great home video showing easy set up for fishing off of a traditional SUP. Convert an Airborn fishing boat into a stand up paddle board. Biggest fish wins and winner takes all the cash!! Valid fishing license is mandatory. SUP fishing derby tickets available at Tofino Paddle Surf. Elite Series James Niggemeyer talks about lessons learned on fishing tour. Pro Angler Emcee Dave Mercer, Host of "Facts of Fishing The Show" trys SUP fishing for the first time. The following video is an ad for Patagonia clothing from FISH WEST. You can watch the video and/or click to enter the FISH WEST website. But first bookmark http://www.standuppaddleboardingguide.com/sup-fishing.html so you can easily return to this page.